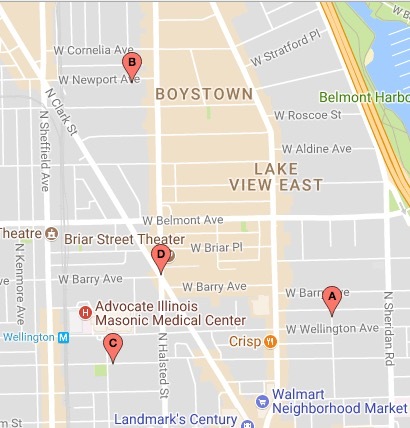 A robbery offender working the Lakeview East area is targeting victims who have been riding the CTA or patronizing local bars, police said in a community alert on Tuesday. Police have connected four robberies to the man since March 23. After identifying his target, the offender stops the victim, displays a handgun, and demands the victim’s property, police said. All of the victims have been walking alone. 3000 Block of North Pine Grove on March 23 at 11:45 p.m. The offender approached a woman and announced a robbery while displaying a gun, police said. The woman turned over her purse and cellphone to the man who then fled westbound on Barry. The woman, believing that she saw an orange tip on the gun that could indicate that it is a toy, pursued the man. She lost track of him as he turned north on Halsted Street, police said. 800 Block of West Newport on March 25 at 11:00 p.m.
A 24-year-old man told police that he was near Newport and Halsted when an unknown offender approached him, pulled out a handgun, and demanded his property. After getting about $100 cash and the man’s phone, the suspect ran away. The victim told police that he remembered seeing the suspect standing outside of Progress Bar on the corner of Halsted and Roscoe shortly before being robbed. 2900 Block of North Mildred on April 1 at 2:30 a.m. The 23-year-old victim said he was walking in the 2900 block of North Mildred around 2:30 a.m. when a group of strangers yelled for him to stop. At the same time, an unknown person punched the victim in the face, causing him to fall to the ground. Another man then displayed a handgun and demanded the victim’s property, police said. After getting the man’s cell phone and credit cards, the offenders fled on foot. The fourth robbery was reported in the 3100 block of North Halsted at 4:30 a.m. on March 23, police said. The robber is described as male, black, between the ages of 25 and 50, 5’8” to 6’3” tall. He usually wears a jacket with fur around the hood, according to police. Anyone with information about the offender is asked to call Area North detectives at (312) 744-8263.